There are many projects taking place in the lab and with collaborators from other institutions. A few projects are listed below. For post-docs, students and volunteers interested in joining the lab, see the lab’s research opportunities. Hawkmoths are one of the most charismatic groups of moths. With incredible proboscides that can reach more than a foot in length, they are a primary focal group to understand life-history evolution. Building on the phylogeny of Kawahara et al. (2009) and Breinholt et al. (accepted), our goal is to test ecological hypotheses on how such a remarkable group became so successful. One of our primary foci is an NSF-funded project on anti-bat ultrasound production and hearing in hawkmoths with the Barber Lab at Boise State University. Do these moths communicate with bats? Our recent studies suggests that hawkmoths produce ultrasound to bat calls (Barber and Kawahara, 2013, Biol Lett; Kawahara and Barber 2015, PNAS). 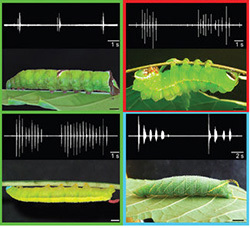 How has sound production evolved in hawkmoths and other moths? We use state-of-the-art filming technology and molecular tools to understand this complex interaction. Fieldwork is conducted in Borneo and South America. A photo gallery of hawkmoths can be found here. Insects comprise ~60% of the Earth’s described species, and butterflies are without doubt the most popular. Butterflies include seven families, roughly 1800 genera, and 19,000 described species. Most butterflies are brightly colored, diurnal, and they have been at the center of scientific research for hundreds of years. 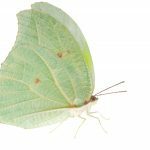 The major efforts to understand butterfly biology are impeded by significant spatial and taxonomic knowledge gaps, along with scattered, incomplete, and non-integrated sets of resources. Overcoming these gaps and integrating phylogenetic, spatial, ecological, and trait data across the clade promises to provide an unparalleled opportunity for comparative analyses at the global scale, which has hitherto been impossible for any insect group. 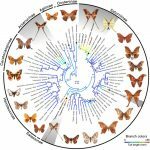 With the Guralnick Lab at UF, Pierce Lab at Harvard, Jetz Lab at Yale, Reis Lab at George Washington U., and the Lohman Lab at CCNY, we are comprehensively synthesizing trait data and building an evolutionary framework for butterflies through ButterflyNet. The project is funded by a $2.5M grant from the NSF GoLife program, and is supporting a postdoctoral fellow and graduate student in the Kawahara Lab. 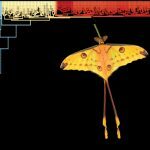 There are nearly 150,000 species of moths and they possess wings with many shapes and sizes, but little is known about why these shapes and sizes have evolved. With international collaborators, we are examining the function of different wing shapes and sizes and combining these with molecular phylogenetic approaches to examine why such features originated. Our lab is using tools to digitize museum specimens via NSF’s Lepidoptera of North America Network (LepNet) project, and utilizing geometric morphometric software and methods to characterize wing shape and size (see Zhong et al. 2016). This project is funded in part by the National Science Foundation (NSF) and National Environmental Research Council, UK (NERC), totaling nearly $1.2M. Acoustic signaling is a central sensory system for many animals. The majority of studies have examined acoustic signaling in the adult stage, and few have examined inter- and intra-specific signaling in non-adult life stages. With the Yack Neuroethology Laboratory at Carleton University, Canada, we are examining the evolution of acoustic signaling in lepidopteran caterpillars. Previous work includes Scott et al. (2010, Nature Communications), Bura et al. (2016, Scientific Reports), which focused on Drepanoidea and Bombycoidea larvae. Additional studies on larval sound production are being conducted in collaboration with the Yack Lab, among others. Insect herbivores and their hosts dominate terrestrial biomes and may constitute nearly 50% of the earth’s biodiversity. As herbivores and pollinators, Lepidoptera are one of the primary insect groups responsible for the radiation of flowering plants. Since the pioneering work of Ehrlich and Raven (1964), there has been great interest in trying to detect and understand macroevolutionary patterns in insect-plant associations. Most macroevolutionary studies on herbivorous insects have focused on external plant feeders and few have examined patterns of life history evolution for internal herbivores such as leafminers. Gracillariidae constitute the primary group of plant mining Lepidoptera. With a team of international collaborators, we are building an evolutionary framework for this diverse lineage (Kawahara et al. 2011; BMC Evol Biol, Kawahara et al. 2016; Syst Ent). A photo gallery of Gracillariidae can be found here, and a video of a project funded to the lab by NSF and NatGeo in Hawaii (Hawaiian leaf miners, can be found here. Fancy Cased Caterpillars in the genus Hyposmocoma include an extraordinary group of moths all endemic to the Hawaiian Islands. The archipelago is one of the most threatened species “diversity hotspots” in the world, and large endemic radiations are thought to have already lost many of their species. The total number of Hyposmocoma species may be greater than the radiation of Drosophila. Unlike most cosmopterigids which are internal feeders of leaves, seeds and stems, Hyposmocoma feed externally. Hyposmocoma have extraordinary, in some cases globally unique, life-histories and behavior. Some caterpillars are carnivorous, feeding on tree snails and others are amphibious living above and under water along streams. Larvae in the genus create silk “cases” in which they perambulate while protected and camouflaged. 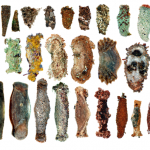 An extraordinary diversity of larval case types exists, and to date, more than ten different types have been identified. 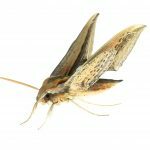 The research is focused on the systematics, diversification and evolution of these moths, and is being conducted in collaboration with the Rubinoff Lab at the University of Hawaii.